It’s late on a weeknight, and there’s only one open checkout line at the grocery store. You clutch a bottle of Pepto Bismol in one hand and a sleeve of saltine crackers in the other as the line slowly creeps toward the register. Finally, as you will the energy to lift your items onto the belt, your stomach drops — for reasons unrelated to the items you’re attempting to buy in an efficient manner. The customer in front of you just broke out their checkbook for a transaction consisting of $12 worth of snacks. Yes, in this year 2017 A.D., the person in front of you plans to write a check. With a pen. On paper. For snacks. You look behind you. You can’t see the end of the line anymore. But you can tell the masses are getting restless. “How do grocery stores even process a check payment?” you wonder as you look to the other people in line, searching their annoyed faces for answers. You’ve never had to ponder this question. You’ve never cared until now. Everyone has had one of these experiences. But is check writing a financial atrocity? Or simply a minor inconvenience for debit and credit card wielders everywhere? I’m here to tell you it’s somewhere in between. It takes about 67 seconds to complete a transaction with a check, according to a retail expert interviewed by The Wall Street Journal for the article that inspired this post. Compare that to 25, 24 or 20 seconds for cash, credit card or debit card transactions, respectively. But when’s the last time you saw a check transaction take a mere minute and seven seconds to complete? That transaction clearly didn’t include a request for a driver’s license. Or the scribbling of the identification number and phone number. Or the huffy sigh of the check writer, who just wrote the wrong amount and needs to start over. I have a hard enough time figuring out if the card terminal reads chips. If I wrote a check, I’d have to perch with my checkbook, write legibly, not screw up the amount, not rip the check when I’m tearing it out of the book, and deal with the glares of an entire grocery store. Check writers, how can you seriously take all that pressure? In the olden days, before credit card offers ran rampant, writing checks was routine. You carried cash to cover small purchases and pulled out your checkbook for larger ones. But plastic is popular now. The Federal Reserve Cash Products Office reported customers completed more than 40 billion transactions with checks in ye olde year 2000, but by 2012, rising debit transactions had cut the number of check transactions in half, to 20 billion. And that’s a stat from five years ago. Now? Check payments are infrequent enough that they stop a retail operation in its tracks. So why does anyone still write a check at the store? “People who pay by check in stores say it gives them a greater feeling of security than using plastic and it is more convenient than carrying a wad of cash. They also say they feel more in control of their spending,” Robin Sidel wrote in The Wall Street Journal. Sure, I feel like a boss when I write a check. Still, I try to save these occasions for the essentials — major expenses, like rent — and special occasions, like wedding gifts and my nephews’ birthdays. But writing a check doesn’t feel safe. If I pay by check at a cash register, I’m essentially handing over a tidy slip of paper announcing my name, address, and routing and account numbers. OK, the cashier probably doesn’t give two hoots and has no intention of setting up an elaborate transfer scheme to leech money from my checking account. But paying by check means that money is likely to to float around the retailer for a day or two (or three, or five, depending on the size of the business) before the recipient deposits it and the money leaves my account. Unless I’m keeping handwritten records of each purchase — which I would never do at the register because holy cow, how many eyeballs are staring at me right now? — I’m waiting for that balance to refresh on me. Meanwhile, if I pay with a debit or credit card, I swipe or insert my card, pray I don’t get skimmed and usually know within an hour that the bank has accounted for the purchase. I know — I’m in that certain percent of America that’s just rolling in privilege and has a regular paycheck to depend on. Many people without the resources or desire to keep a close electronic eye on their checking account balance turn to checks. It’s still legal. It’s just not the best method for financial stability. Google is rife with inquiries about how long it takes a check to clear. The delay between a transaction and when funds whoosh out of your account can seem like a good thing if you’re waiting for a deposit to register in your checking account or hoping some money comes in before the check clears. But paying with a check isn’t a reliable way to beat the clock, especially now that many retailers are taking advantage of the Check 21 Act’s electronic check-scanning system. Trying to buy time by paying with a check might work a few times, but on the instance it fails, you’re going to end up with a bounced-check fee of about $30 — and likely overdraft fees on top of that. 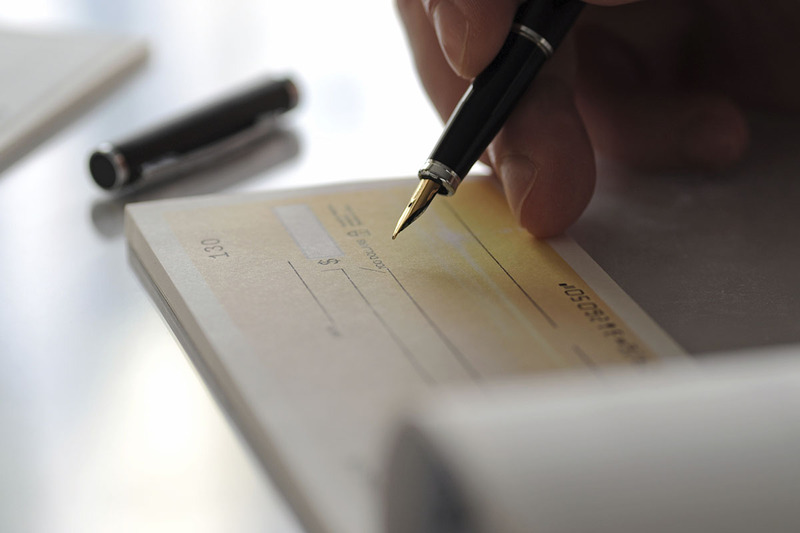 In my past life as a small-business owner, I heard warning bells whenever someone wanted to pay with a check. Most of the time, it was just an inconvenience as a small business, as we didn’t make regular trips to the bank. But sometimes, it meant a customer was trying to buy time by using a check. My favorite interaction was with a woman who asked if I would offer a discount if she paid with a check at a large, crowded craft show. Girl, no. I’ll gladly pay the 2-point-whatever percent processing fee to take your credit card from your hand, insert it into a card reader attached to my iPad and know in 10 seconds if your payment has gone through or not. I’m not saying you should throw your checkbook into the fire and abandon this traditional payment method. Sometimes you need a backup plan. Sometimes, you just want to get into a time machine for a minute. Beep beep boop, see ya later, gotta go dig out my Whitney Houston cassettes and actually get out of my chair to change the channel on the TV. But it’s time to accept the fact that checks are fading away. Even the United States Postal Service, probably the entity most upset by the rise of online bill payment options, knows the end is nigh. It found consumers only paid 37% of their bills by mail in 2013 — down from 74% in 2003. You want to send 37% of your bills the old-fashioned way? Go for it, traditionalists. You can keep as many checkbooks at home as you want, even though check pricing is a total racket. Take your checkbook to the doctor’s office. The PTA committee meeting. The car dealership. Mail a check to your landlord. Fine. But don’t bring those checks into the grocery store. Please. Lisa Rowan is a writer and producer at the Penny Hoarder. She has a hard time hiding her emotions when she’s in uncomfortable public situations. 10 Hours Ago Dear Penny: I Can Only Afford Interest on My Student Loans. What Can I Do?